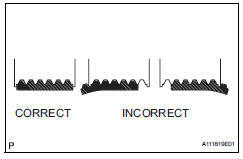 If the battery is weak or if the engine is difficult to start, perform the following procedures. Check the battery for damage and deformation. If severe damage, deformation or leakage is found, replace the battery. Check the electrolyte quantity of each cell. If the electrolyte quantity is below the lower line, add distilled water to each cell. Then, recharge the battery and check the electrolyte's specific gravity. Visually check the battery terminals. (1) Check that the battery terminals are not loose or corroded. Measure the resistance of the h-fuses and fuses. 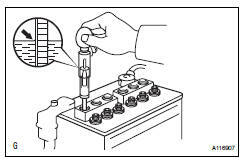 If the results are not as specified, replace the fuses as necessary. Visually check the belt for excessive wear, frayed cords, etc. If any defects are found, replace the v-ribbed belt. Cracks on the rib side of the belt are considered acceptable. If the belt has chunks missing from the ribs, it should be replaced. Check that the belt fits properly in the ribbed grooves. Confirm by hand that the belt has not slipped out of the grooves on the bottom of the pulley. Visually check the generator wiring. Listen for abnormal noises from the generator. Check that no abnormal noises are heard from the generator while the engine is running. 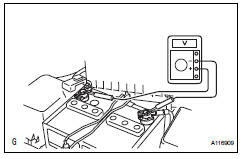 Connect a voltmeter and ammeter to the charging circuit as follows. 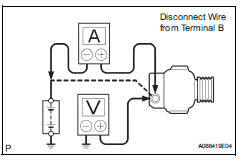 Disconnect the wire from terminal b of the generator, then connect it to the negative (-) lead of an ammeter. Connect the positive (+) lead of the ammeter to terminal b of the generator. Connect the positive (+) lead of a voltmeter to terminal b of the generator. Ground the negative (-) lead of the voltmeter. Keep the engine speed at 2,000 rpm and check the reading on the ammeter and voltmeter. If the battery is not fully charged, the ammeter reading will sometimes be more than the standard amperage. With the engine running at 2,000 rpm, turn the high beam headlights on and turn the heater blower switch to the "hi" position. If the battery is fully charged, the indication will sometimes be less than the standard amperage. If this is the case, add more electrical load (operate the wipers, rear window defogger, etc.) And check the reading on the ammeter again.